Over four years in development and tested over 4,000 miles, the AeroHead™ is a truly revolutionary hunting boot. It features patent-pending AeroForm™ technology, a groundbreaking new construction that offers an extremely comfortable fit, with the ultimate in flexibility and durability all in a lightweight form. The shell around the neoprene core is molded with polyurethane, which is more durable, flexible, insulating and lightweight than rubber. With a thick layer of cushion underfoot, an integrated shank for support and a rugged rubber outsole, the LaCrosse AeroHead™ redefines comfort and protection in the field. · Patent-pending AeroForm™ technology featuring a revolutionary liquid polyurethane over neoprene construction which provides an extremely lightweight and flexible glove-like feel to the boot with highly durable, abrasion resistant and insulating protection. · Uncompromising scent-free and waterproof protection. · Adjustable back gusset and strap with adjustable fit for various leg sizes. · Armor Weld liquid rubber protective coating on the seams. · Quick drying and moisture wicking jersey knit liner. · Ankle-Fit™ design locks the heel in place to prevent excess rubbing and chafing. · Injected PU midsole for added cushioning with an integrated shank to cover the arch of the foot providing support and stability when climbing on ladder rungs. · 3.5MM naturally insulating neoprene. · Realtree Xtra Green camo pattern. · Aero™ non-loading outsole features a lightweight rubber compound for superior durability and traction in mud. · Rated for temperatures as low as -30° F.
The above is what LaCrosse has to say about its new flagship rubber hunting boot, the Aerohead. Last year, I reviewed the previous incarnation of this type of boot, the Alpha Mudlite. The Alpha Mudlites quickly became my favorite hunting boot, boots that I've used on days when the high was -10 degrees F. The 18" height Alpha Mudlites weigh 5.2 lbs per pair and are rated rated for temperatures between -20° to 80° F.
The new 18 inch Aeroheads are substantially lighter at 4 lbs. and are rated to -30° F. While I'm about as far away from a footwear designer as imaginable, my impression is that the primary new feature here is the polyurethane component. There is no question that they are more comfortable and flexible than their previous offerings. What I have been using is the 3.5 mm neoprene edition @ 4 lbs. Rated to -30 degrees F. as already mentioned. Also available is essentially the same boot with 7.0 mm of neoprene. That yields a -60 degree F. temperature rating and increases the weight to 5 lbs. per pair. 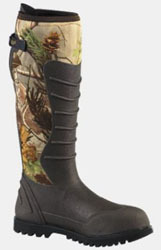 For the last several years, I've worn LaCrosse neoprene boots almost exclusively, including black bear hunts and pheasant hunting where the high temperature of the day was -6 degrees F. The AeroHead is an upgrade from what has always been durable, waterproof, easy to put on boots. As far as the claimed better insulation, well, that area would be my sole quibble. Perhaps someone with more highly tuned skin than myself could tell the difference between “as low as” -30 deg. F. boot and a theoretical -40 degree boot, but there is no discernible difference to me. Aside from that dubious claim, the rest of the package is quite appealing.